Oct. 21, 2013 1:00 p.m.
Larry Majeski the respected and popular former councillor and CAO of Leduc County who died in a sea doo accident at Pigeon Lake on September 10, 2011 was honored when The Larry Majeski Memorial Golf Game and BBQ was held in his memory to raise funds for The Mulhurst Bay Fire and Rescue Department. The Inaugural Larry Majeski Memorial Golf Game and BBQ was held this past August 24th at Pigeon Lake. Dave Majeski brother of Larry and his friends Richard Wong and Jeff Battershill were at the Mulhurst Fire Department October 8th to present Fire Chief Wayne Benson with a cheque of $10,345.00 raised at the tournament. “When we started this, we thought if we raised $2,000.00 it would be a success,” Dave Majeski said adding “$5,000.00 came from just one donor the RBC Foundation. 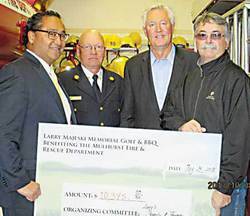 We wanted to raise the money because we were so impressed by all the volunteers that came out and helped with the search for my brother.” The Majeski family had even asked for donations to be made in Larry’s memory to The Mulhurst Bay Fire Society in lieu of flowers. The new pumper should arrive by the end of February and will feature a plaque in memory of Larry Majeski.